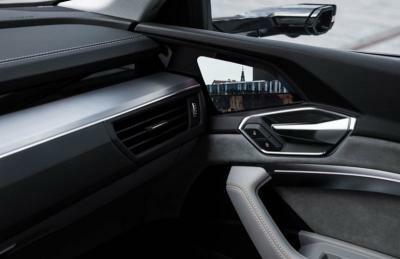 Audi introduced a new e-tron EV crossover concept car, which includes 7" OLED virtual side mirrors (coupled with external cameras) instead of the normal mirrors. This is not a new concept - but it seems that Audi is progressing towards bringing this design idea to commercial cars. In 2012 Audi equipped its R18 sports prototype with a 7.7" virtual rear mirror, and later announced it will bring such mirrors to future e-tron cars.